The hero and patriot Michael Davitt was born in Straide County Mayo on the 25th March 1846 in the midst of the Great Famine. His father Martin Davitt and mother Catherine Kielty, were tenants on the John Knox estate at Straide. 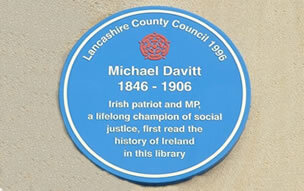 Michael Davitt was the second of five children, four were born in Straide; Mary in 1841, Anne in 1848 and Sabina in 1850. Michael’s only brother James was born in Haslingden on the 30th June 1853 and died 2 years later 12 March 1855. The language of the home was Irish. When evicted from their home in Straide the family went to the workhouse in Swinford, where Catherine discovered rules required Michael to be separated from her. The family left the workhouse immediately. The couple with their children decided to join the many evicted families emigrating in hope of a better life. Martin Davitt got place on a horse and cart for the children with another family from the area travelling to Dublin for the boat. When they arrived in Liverpool they visited with friends before setting out on foot to Haslingden nearly 50 miles away. Haslington was an area of England where locals from the Straide area had already found work. Davitt’s father got temporary lodging for the Davitt family with an acquaintance. But after only two days, they were evicted for a second time when it was discovered that Michael had the measles. Davitt’s father then set up a tent against a wall. James Bonner a worker from County Armagh, took the sick child and family into his house, even though he had four small children of his own. The census of March 1851 has the Davitt’s as lodgers in Owen Egan’s house in Wilkinson St. At that time there were a total of fifteen people living in the small house. Later the Davitts succeeded in renting at Roch Hall, where families from the west of Ireland lived. Michael’s father and mother found work as hawkers, and a year later Martin found work as a farm labourer for fifteen shillings a week. Martin Davitt was literate in English and wrote letters home for other families whilst also teaching them to read and write in English. At the age of nine years Michael Davitt started working in a cotton mill at Ewood Bridge, on the outskirts of Haslingden. He passed himself off as over thirteen years and worked from 6am to 6pm with one and a half hours off for dinner & breakfast. His pay was 2s.6d, a week. He later moved on to Whittaker and then to Stellfoxe’s Victoria Mill near Baxenden outside Haslingden. It was here, that he got his right arm caught and badly injured in a machine 8th May 1857 which resulted in amputation. After Michael Davitt recovered from his operation, John Dean a cotton manufacturer became his benefactor and Davitt got a second chance at education in the local Wesleyan school run by George Poskett, which he attended for 4 years. In 1861 Michael started working again, this time under better conditions for Henry Cockcroft, who had a Post Office, printing and stationary business. In 1858 he started evening classes at the Mechanics’ Institute where he had the benefit of a library and newspapers. He studied Irish history. It was at this time Michael Davitt turned to politics and joined the Fenians. He met Ernest Jones, the chartist leader who had spent two years in prison and was influence by him. In 1863 his sister Mary married Neil Padden born in Foxford. Padden emigrated to America in 1865 and after finding work in the mines in Scranton was later joined by Mary. By 1870 Michael Davitt had risen through the ranks of the Fenians and was organising secretary for Northern England and Scotland. He was arrested in Paddington Station in London for smuggling arms to Ireland. After 7 years in Dartmoor Prison he was released on a ticket of leave and returned to Ireland January 1878 along with 3 other released prisoners. 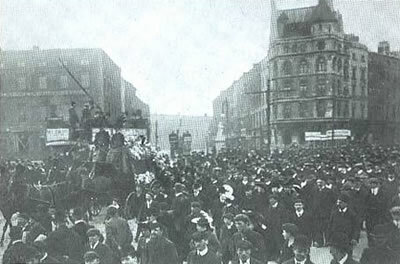 They were welcomed by Irish Political leaders including Parnell and James Daly. The need for land reform was highlighted by a meeting organised by James Daly, editor of the Connaugh Telegraph, who was very active with the Tenants Defence Association. Daly advised the tenants in January 1879 to organise a meeting at Irishtown to highlight the injustices and evictions taking place in the area and in particular on the Bourke estate. The meeting was postponed until 20th April. 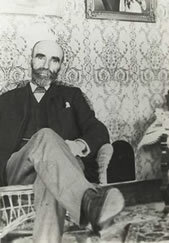 By March 1879 Davitt having returned from a Fenian meeting in Paris, attended to various other matters in Manchester and Dublin, he then visited his cousins in Balla Co. Mayo and helped to organise the Irishtown meeting which was chaired by James Daly of Castlebar. Davitt compiled two of the resolutions. Thousands attended the meeting, and resulted in eviction notices being withdrawn from the Bourke tenants and a 25% reduction in rents. The success of Irishtown showed the power of mass demonstrations and that real and lasting improvement of tenants lives could be achieved. On th 16th August at Daly’s Hotel in Castlebar, the members of the Tenants Defence Association ( including Davitt & Daly ) came together after the success of the Irishtown and other land meetings to form the Land League of Mayo. From that the National Land League of ireland was established in Dublin in October 1879 with Charles Steward Parnell as its President and Davitt one of its Secretaries and James Daly a member. Their agenda was the 3 F’s for reform: fixity of tenure, free sale and fair rent. Davitt and the Land League leaders toured the country addressing meetings and organising resistance. The most publicised incident took place at Lough Mask House, near Ballinrobe. Captain Boycott a former British army officer had farmed for 18 years on Achill Island moved in 1872 to the more accessible area of Cong as agent for Lord Erne’s properties in Mayo. In 1880 the Land League organised a campaign of ostracisation against the agent Captain Boycott as a result of the continue increase on tenants rent by the absentee Lord Erne. No shop would supply food, servants left, crops were rotting in the fields, blacksmiths refused to shoe his horses. James Redpath an American journalist for the New York Tribune, who reported on the campaign coined the new word for the English language, “Boycott”. Some years later Michael Davitt officially opened the first Bridge connecting Achill Island with the main land, replacing the irregular ferry service at Achill Sound. was in support of the Home Rule Bill. In 1895 Michael Davitt was elected MP for South Mayo in the general election. He travelled to Australia and acknowledged funds received for the Land League and spoke on the conditions of the Maori and Aborigine people. In 1903 Michael Davitt traveled to Russia as journalist for New York American Journal, highlighting the pogroms taking place in Bessarabia. He condemned anti-Semitism in a sermon given by Redemptorist Fr Creagh in Limerick 1904. Davitt played an important part in the Trade Union movement in England and Ireland and in his last years was involved with the growing English Labour Party. He was also one of the initial patrons of the GAA together with Parnell and Archbishop Croke, numerous GAA clubs, grounds or stands bear his name throughout Ireland and beyond. 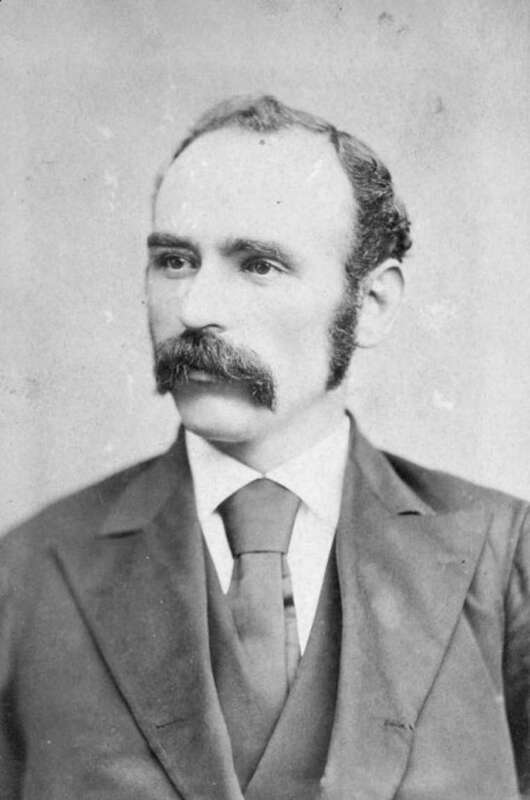 Michael Davitt was a patron of Glasgow Celtic Football Club. It is believed by many that the name ‘Celtic’ in the title of the club originated with Davitt. He was an honorary member of the board and in 1892 Michael Davitt laid the center sod on the new Celtic Park to great acclaim. The silver spade used to perform the ceremony was presented to Davitt as a present. Davitt was a strong supporter and remained committed to the ideals of Glasgow Celtic throughout his life. Michael Davitt died at Elphis hospital, Dublin on May 30th 1906 of septicaemia, after having a tooth extracted. Not wishing to have a public funeral, Davitt’s body was brought quietly to the Carmelite Friary, Clarendon Street, Dublin. Over 20,000 people filed past his coffin the next day, his coffin was then brought by train to Foxford, County Mayo.